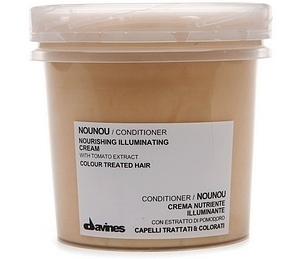 Ideal for color treated hair, the Davines: Nounou shampoo and conditioner brings out the original natural hair tones and restores health and shine to damaged hair. The key factor is sodium chloride, a common ingredient to slowly remove cosmetic color from the hair, which is perfectly suited for colored hair. The synergy of its ingredients have a deep restructuring action, protecting color, and restoring the body and suppleness, maintaining the same luminosity and fullness of tone of the color.